Facebook’s CEO Mark Zuckerberg often speaks about global Internet connectivity. If you pay attention, Mark Zuckerberg is remarkably consistent. For the past several years, one of the highest-profile projects he’s been focused on has been expanding Internet access around the globe. The Facebook CEO and co-founder is doing this by offering free cellular service through an initiative he started called Internet.org, and via drones that beam Internet connections to far-flung places. Not everyone agrees with Zuckerberg or the way in which he’s going about these projects, particularly the limited nature of the free Internet connections some of Facebook’s programs offer. 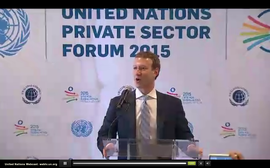 Still, Zuckerberg isn’t backing down, saying these efforts will make the world a better place. He’s made similar comments at public town hall meetings and various press interviews too. His consistency hasn’t stopped the criticism, but he’s not that worried. “It turns out everything you want to do that’s impactful is controversial,” he lamented in October. In the meantime, he’s still figuring out how to make it successful. Among the revelations from the Wired story: Hamid Hemmati, a researcher at NASA’s Jet Propulsion Laboratory who Zuckerberg emailed about his Internet-beaming drones, initially thought the communication was spam. Zuckerberg is also apparently antsy to get this project off the ground. Some of his researchers told Wired they have to remind him that beaming Internet around the world isn’t like writing code. A Facebook spokesman did not immediately respond to a request for comment.